Be the first to share your favorite memory, photo or story of Chester "Cindy". This memorial page is dedicated for family, friends and future generations to celebrate the life of their loved one. Cindy McGinnis Buris July 27, 1950 – January 29, 2019 passed away peacefully in her home. A daughter, sister, wife, mother and friend, she is described as always being in control as well as fun loving, positive, faithful and a jokester. She married the love of her life, James Luther Buris, Sr. in 1968. She was a loyal employee for Wal-Mart for over 25 years and retired from there in 2012. Following her retirement, she became involved in volunteer work. Her favorite was as a delivery driver for Meals on Wheels where she is described as bring sunshine to all she visited. She also joined the Senior Center and became involved in activities, exercises, and her favorite, chair volleyball. She loved talking about her games. Those who knew her knew that in addition to bible study, some of her favorite things were old westerns and soap operas. 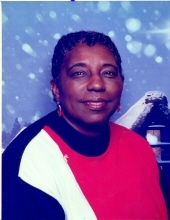 Church was an important part of her life and she was an active member of Muller Street Church of Christ in Gainesville and then MLK Church of Christ in Denison. Cindy is preceded in death by her father T.C. McGinnis, her husband James Luther Buris, Sr. and her sisters Martha Jo Moore and Peggy Love. She is survived by her mother Henrietta Turner, her five children Maya Machelle Buris Coke and her wife Sandy; James Luther Buris, Jr. and his wife Pam; Charles Ray Buris and his wife Laura; Patrece Miller McCloud and her husband Todd and Christopher Buris. She is also survived by her siblings James Chafin, Charles Bateman, Ray Bateman, Tommy McGinnis, Lizzie Jean McGinnis, RC Love, Betty Love Johnson and Debra Davis Benson as well as 13 grandchildren, 12 great grandchildren, numerous nieces and nephews and many friends. To send flowers or a remembrance gift to the family of Chester "Cindy" Mae Burris, please visit our Tribute Store. "Email Address" would like to share the life celebration of Chester "Cindy" Mae Burris. Click on the "link" to go to share a favorite memory or leave a condolence message for the family.